Released at the end of 2013, ‘Pure Deep House’ proved a big hit with dance music fans and house heads alike, reaching silver disc status, and spending eight weeks in the UK compilation album chart top 10 in the process. 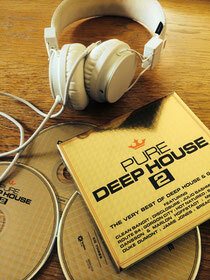 Pure now returns with ‘Pure Deep House 2: The Very Best of Deep House & Garage’, which has just been released. If 2013 was possibly the breakthrough year for the deep house sound, 2014 is proving to be the year it takes over the airwaves, with deep house tracks invading the top of the charts, and showing its crossover appeal. ‘Pure Deep House 2’ celebrates the diverse appeal of house and garage, showcasing cuts from recent chart-toppers Clean Bandit, Duke Dumont and Route 94, as well as underground artists such as Julio Bashmore, Miguel Campbell, and Jamie Jones. Comprised of 60 tracks over three CDs, the compilation also features four exclusive new tracks and remixes. CD1 kicks off with The Magician’s remix of ‘Rather Be’ by Clean Bandit and continues the pace with ‘Shake That’ from Dansson & Marlon Hoffstadt, as well as tracks from Disclosure, and three exclusives: ‘Girls’ from Hannah Wants & Chris Lorenzo, ‘Looking For Base’ by Allusion, and Klingade – Jubel (KANT Remix). CD2 features more hits past, present and future, starting with the top three single Klangkarussell ‘Sonnentanz’, and continuing with Richy Ahmed feat. Kevin Knapp ‘The Drums’, Duke Dumont ‘Street Walker’, as well as the exclusive Mark Wells ‘I Love You (Lane 8 Mix)’. CD3 closes proceedings with a journey into classic house and garage music that has influenced the most recent wave of producers, with tracks from Inner City, Industry Standard, Nu-Birth, Bump & Flex, Charles B, Ten City, and more. It’s out on New State Music, check the mini mix below.